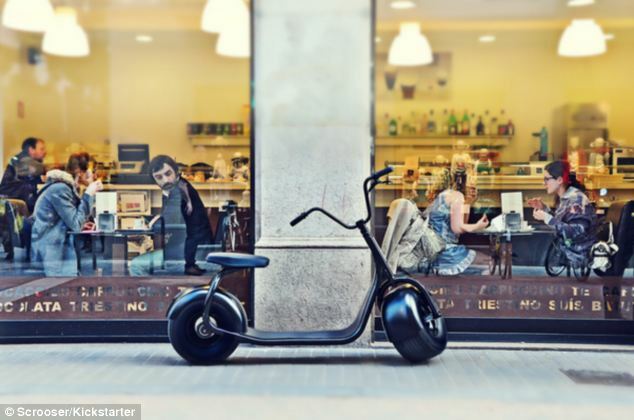 City dwellers could soon propel themselves through rush hour with just few kicks on a fat-wheeled scooter. 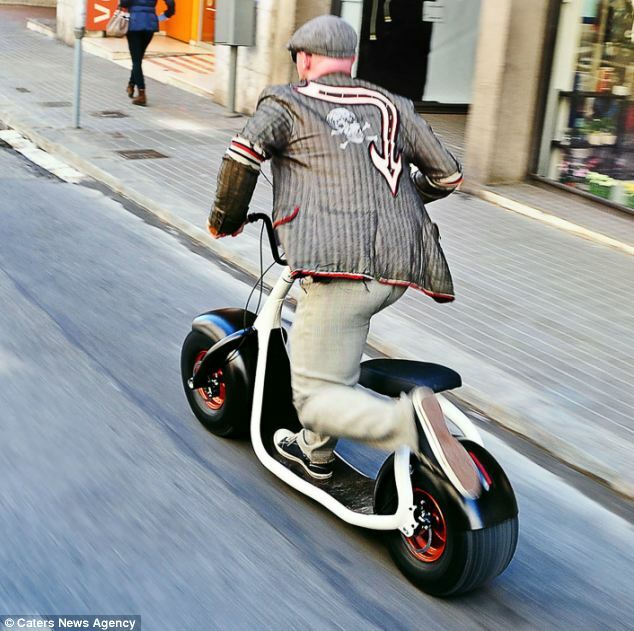 Described by the makers as a riding experience similar to ‘going surfing or snowboarding through the city’, the Scrooser can zoom through the streets at 2mph to 15mph. The design is a cross between a child's scooter, a Segway, and a bike and lets the rider stand or sit. It doesn’t require a helmet or a licence to operate. Each time the rider kicks the ground, an intelligent impulse drive provides electric power support augmenting the amount of physical force the foot has pushed off the ground with. The impulse drive kicks in automatically when a speed of 2mph or greater is reached. The engine is a direct drive motor integrated into the rear wheel rim, which means that there are no gear belts, linkages or any other additional elements that could break. 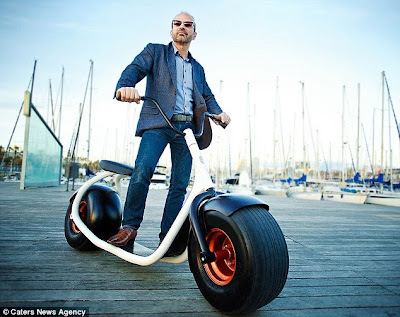 According to the makers, a German company of the same name, while riding in Eco mode, one battery charge will last an estimated 25 days in the city environment. They claim it takes only about three hours to charge the battery with the standard charger. 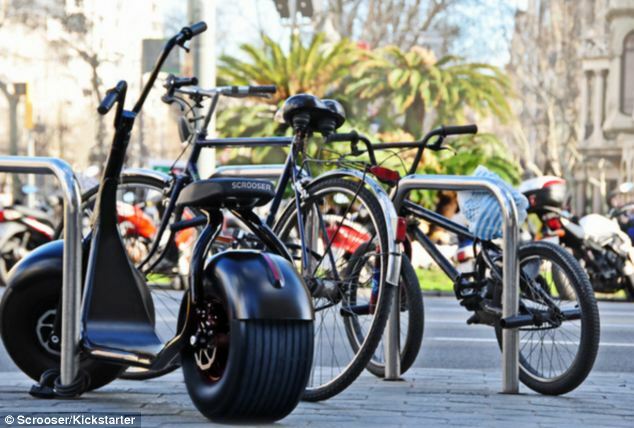 The group believe that traffic congestion cannot be solved by eMobility alone. Instead, Scrooser aims to be more intelligent by moving riders through urban areas efficiently, saving time in covering short distances. Founder Jens Thieme describes the invention as ‘a completely new vehicle category’. ‘You can ride it at 6mph, a perfect pace to manoeuvre through pedestrian-filled sidewalks, but feel free to race cyclists on bike paths at a maximum speed of up to 15mph,’ said Thieme. Thieme added that one of the biggest challenges during the development of the Scrooser was the frame geometry. The frame consists of two parts. Each half is formed from one piece by a process called 'free-form 3D bending'. The stability is generated through the short successive radii and a high-strength aluminium alloy. In total the frame weights around 6lbs. Having just landed a crowd-funded investment of $120,000, the German group hopes to soon produce the vehicle for the mass market. The group is currently perfecting the electronics of the progressive impulse drive electric motor while finalising manufacturing logistics. The design has just been nominated in the category "mobility" for the GreenTec Awards 2013, which honours pioneers who are committed to a more environmentally conscious future.